A slightly deeper section sister product to the well established Aerorage. A perfect choice for those riders who want a super clean aero rim and no rim brakes. 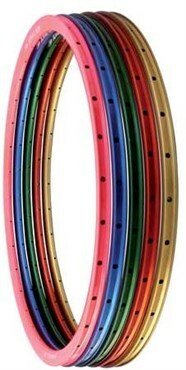 Anodised colour Aerotrack rims can also be used with a rim brake, as the braking surface is machined before colouring. However the colour will - of course wear. Rim brakes should NOT be used on the Paint and Powder coated colour finishes. If a coloured rim brake option is required, we would recommend the Aerorage rim featuring it's machine finished brake surface.